* Our Command Center had been updated again, Summer 2013. After 31 Days of Adventure the Sharpteam has been finding some new rhythm and balance in their days. We have found some particular rhythms that work for us. 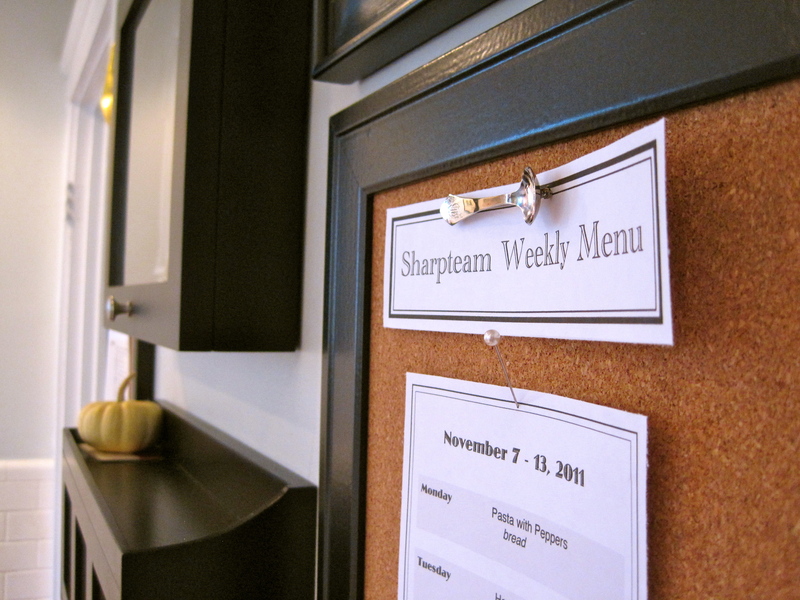 We write up a menu monthly, so that we only have to think about what we are having for dinner once. We sit down together annually, monthly, and weekly to talk about goals. We keep these goals on our icalendars, but wanted to have them some place where we could see them. 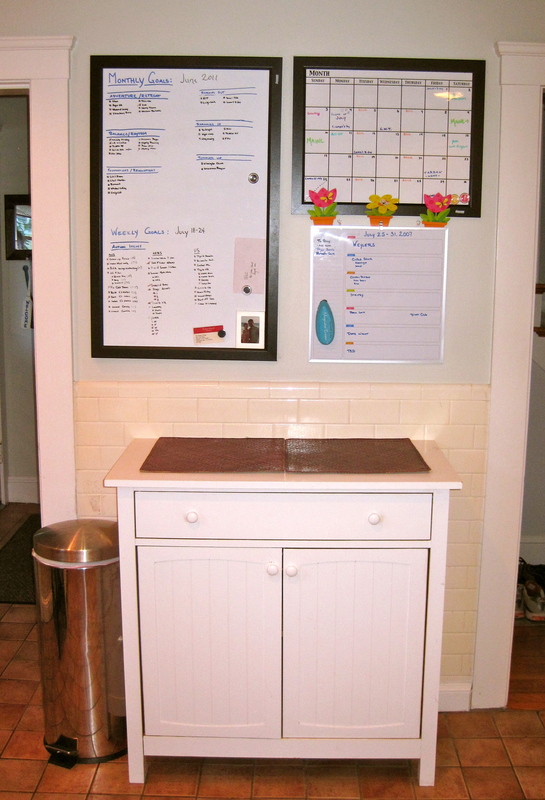 We have a cabinet in the kitchen that has a wall that is just right for a family center. So when we moved here we bought a couple of dry erase boards and wrote our goals out together monthly and weekly. This summer I decided to change it up, and make it more of a gallery wall feel. I had learned that you can write on a picture frame with a dry erase marker and easily erase it, so we got some white frames and this is what our kitchen wall has looked like lately . . .
We were going to post about this “transformation” but the more we lived with it, the less we liked it. It was a lot of glass . . . it was too symmetrical . . . it was more work each week . . . So this past weekend, we re-did the look again. I have been looking at this wall from pottery barn for a while . . .
We were not as interested in the price tag for each of the pieces. But we took the inspiration and put together a wall that is working for us . . . Here is what everything is . . . I am sure that this too will evolve, but one week in, and we are so liking how it works for us. Here is a little detail that I like . . . Here is the evolution . . . Gratitude to Andrew who has done all the work. 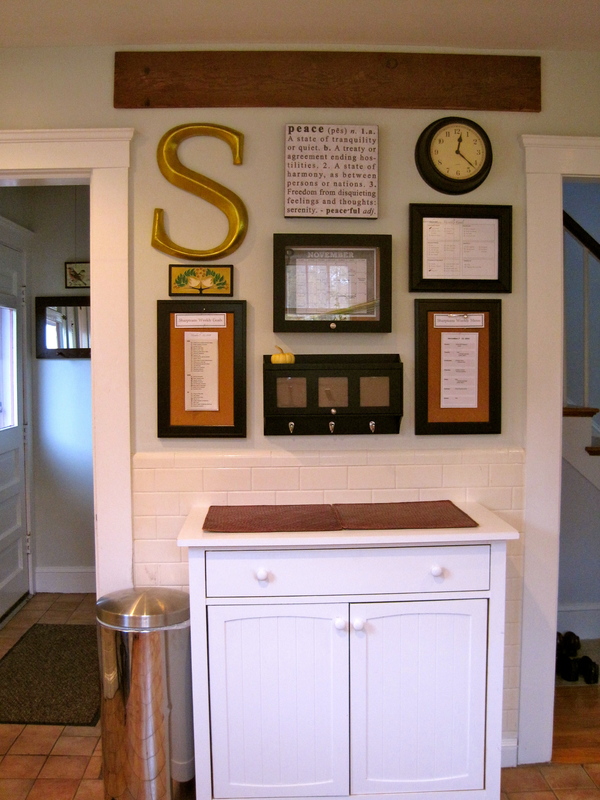 This entry was posted in Decorating, Featured Blog, Organization, Rhythm. Bookmark the permalink. This is gorgeous! You have done a fantastic job! I’m going to pin this because I LOVE organization and this makes me giddy! 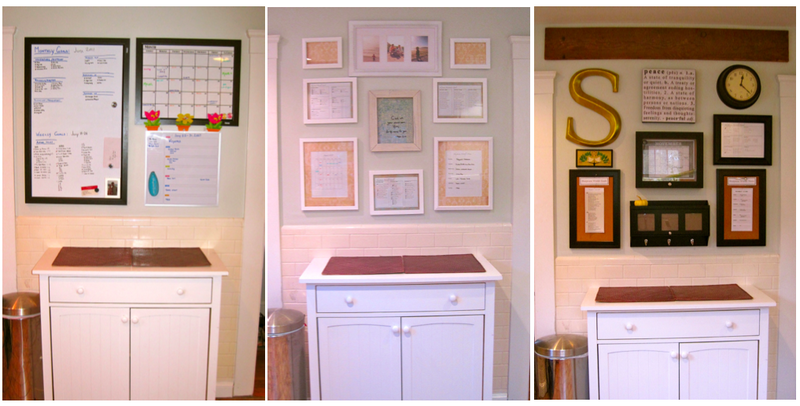 Thank you for joining the Home Decor and Organizing Link Party this week. I featured this on my blog today. Come over and grab a button if you’d like. Michelle, thanks for your encouragement. May you have a wonderful day. How Beautiful! 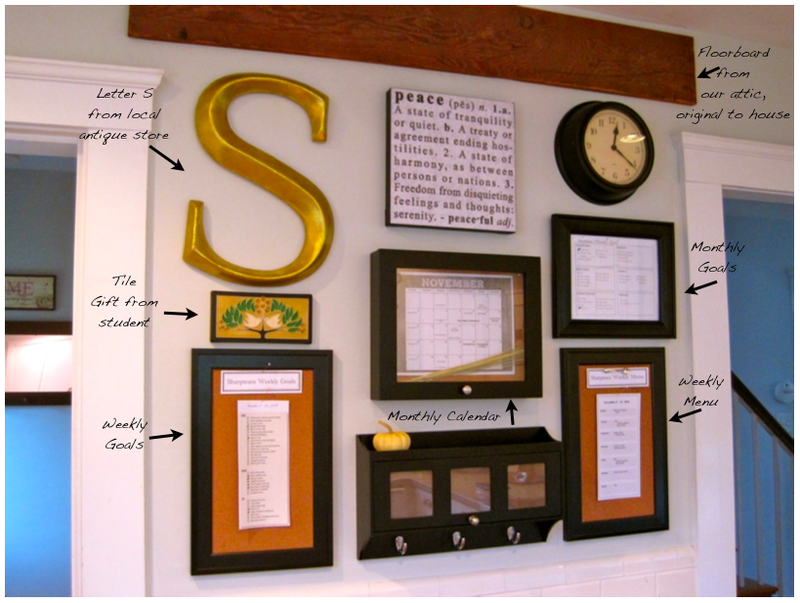 I Love the organizer with the hooks & frames… where did you get it? 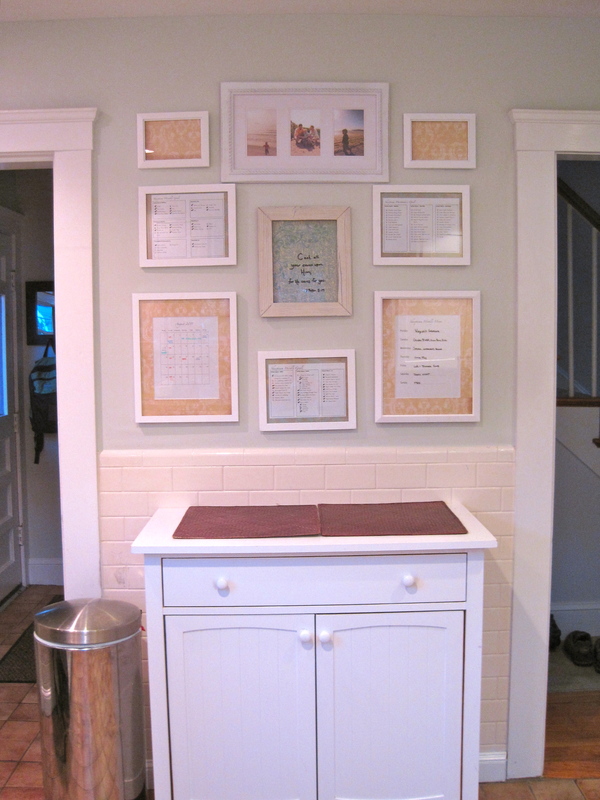 Haley, Thanks so much for your comment The hook & frame organizer is from Target. I tried to find a link online, but could not. It was purchased in the fall. Can I ask, what kinds of goals do you guys put for your family for weekly and monthly? What a beautiful idea! We have big goals that we are working on and each month we ask ourselves what we can do in that month to meet those goals, and this is where our monthly goals come from. Each week we look at the upcoming calendar and ask ourselves what we need to do to be ready for each of the events on it, and put those in our list. We then go through our “box” it is where we deposit all mail that needs action during the week, and we list goals from there. Lastly we re-visit our monthly goals and ask ourselves what steps we can take toward those. We organize our list into things I need to do, things my husband needs to do and things we will work on together. When we are really organized we sit down at night and make daily goals, sometimes this is necessary, but not always. I love the wall! Great job. Very unique command center and lovely . I like that it’s not any about schedules and to-do lists but also your/ family goals that you all want to achieve. This is fantastic. I love how you pulled the style together so well. The “S” is my favorite part. Thanks so much for coming to the Keep C.A.L.M. party! 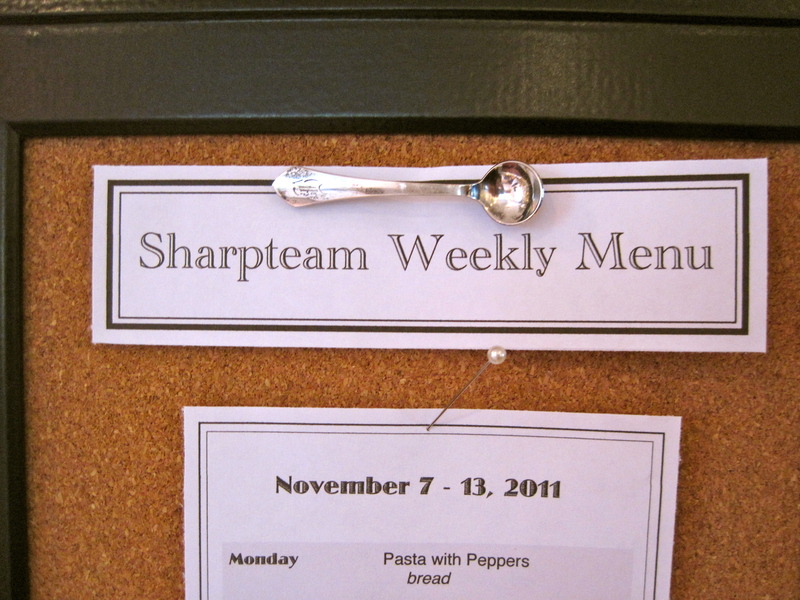 Where did you get the frames for the weekly menu? Is it a frame that you just took glass out of? Or was it specifically with cork? 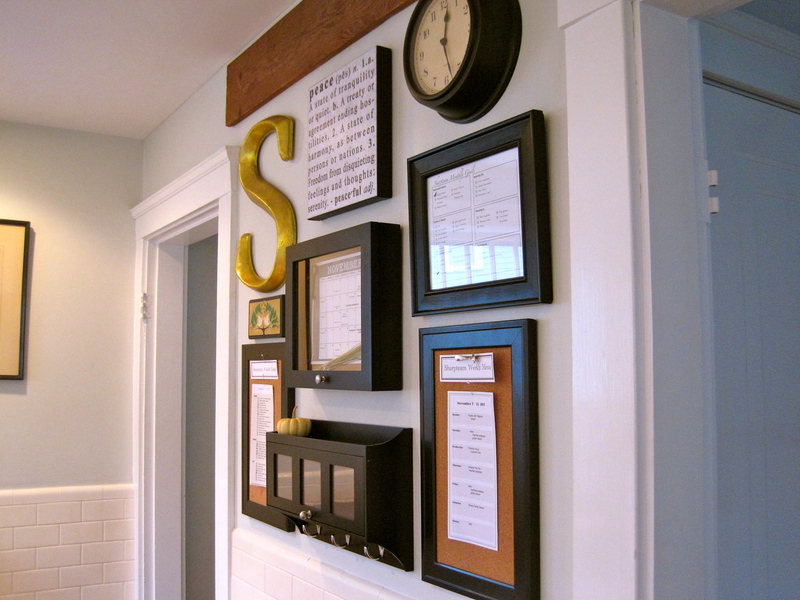 The framed cork boards are from Staples. Thanks for visiting the blog. Looks great! Where did you get the frame for the calendar? I think the calendar frame was from Target seasons ago. I actually have very similar shadow boxes that I got at Marshalls that are in my closet and I use to hang my jewelry. They are in stock at our local Marshalls in white and black.